The initial class of Guardians ad Litem recruited through the Hope, Heart & Home Ministry take their oath in the Miami Dade Children's Courthouse. They are: Lourdes Andujas, Mary Andujas, Joselito Burgos, Martha Pomares-Candia, Maria Garcia Granados, Maddy Garcia, Thais Guevara, Taylor Hobbs, Carmen Lugo, Blanca Palomino, Louvenia Smith, Eric Schwindeman, and Cylena Stewart. MIAMI | After 30 hours of classroom training, online study and courtroom observation, 13 volunteers from three local parishes took an oath at the Miami Dade Children’s Courthouse: They resolved to advocate on children’s behalf in the court system, and support them through the turmoil of abuse, neglect or abandonment. The newly-created Hope, Heart & Home Ministry’s inaugural class had joined the ranks of Florida’s Guardians ad Litem, sworn before Judge Cindy Lederman — a few days shy of her own retirement — to work for children in the 11th Judicial Circuit of Florida. 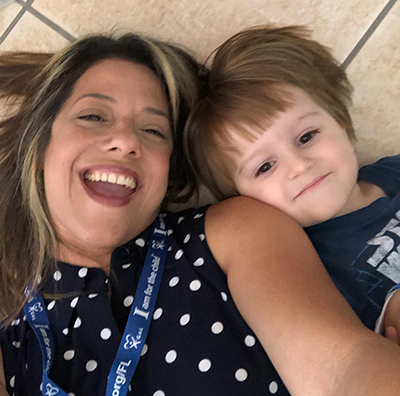 New Hope, Heart & Home ministry Guardian ad Litem Thais Guevara takes a selfie with her foster child. Hope, Heart & Home Guardian ad Litem Blanca Palomino's foster child hard at play. New Hope, Heart & Home ministry Guardian ad Litem Lourdes Andujas poses with her foster child. She has partnered with another new Guardian ad Litem, Mary Andujas, her mother. The December swearing-in was the result of months of effort led by Eric Schwindeman, who recruited volunteers at three Kendall-area parishes, St. John Neumann, St. Louis and St. Catherine of Siena, and coordinated the training with child welfare partners Voices for Children Foundation, Guardian ad Litem and Our Kids. The volunteer Guardians each receive a foster child court case and commit to 12 months of work. Voices for Children funds about 50 percent of Guardian ad Litem’s operating budget, said CEO Nelson Hincapie. 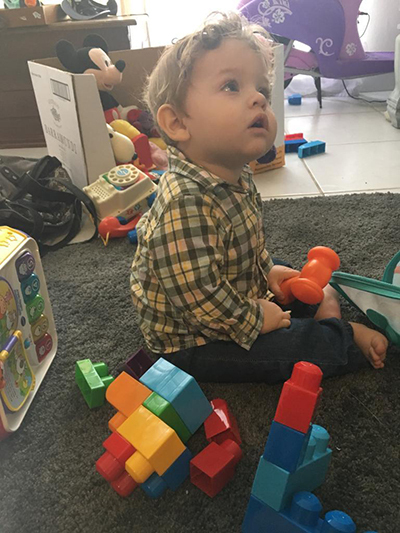 In December, Voices was able to provide Guardians — and funding to support them — for about 92 percent of the roughly 3,000 cases in Miami-Dade County, leaving 300-400 children without any Guardian. Schwindeman, former men’s club president at St. John Neumann, conceived the initiative in March 2018, after hearing Hincapie talk to the parish homeless ministry on the dire needs of Miami foster children. Adopted himself, he approached Hincapie afterwards about volunteer recruitment. “I was brought up in a very safe, secure, loving family and I just think that all kids should have that opportunity,” Schwindeman said. He met with his pastor, Msgr. Pablo Navarro, who embraced the idea and engaged the pastors of the other area parishes. Schwindeman and other organizers then created banners and flyers, manned information tables, recruited supporters and held their first organizational meeting for 50 people in October. Candidates completed applications that included references, fingerprinting, background checks, biographical essays and individual interviews plus three online courses before attending training classes held at St. John Neumann and the courthouse. 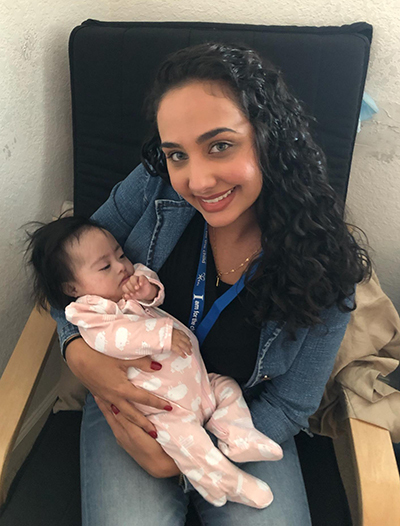 Veronica Guerra, an insurance attorney, signed up through the state to become a Guardian and was assigned to the training at her childhood parish, St. John Neumann, where she even reconnected with her fourth-grade religious education teacher, Schwindeman’s wife, Rosy. 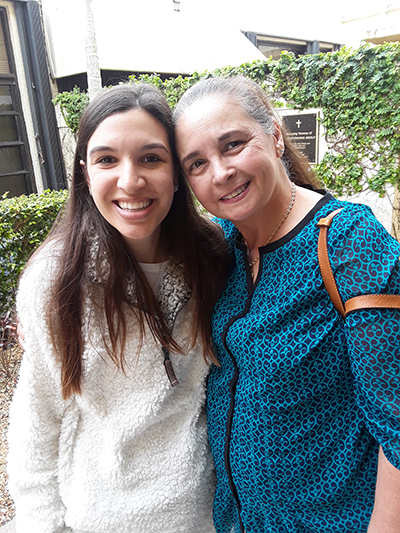 While training to become a Guardian ad Litem at St. John Neumann Parish, attorney Veronica Guerra, left, reconnected with her former religious education teacher, Rosy Schwindeman, wife of Eric Schwindeman, who spearheaded the creation of the Hope, Heart & Home ministry at the parish. Growing up, Guerra served alongside her parents in the parish’s homeless ministry, handing out food packs under the Overtown underpass. The Hope, Heart & Home Ministry’s other mission is to recruit potential foster care families to be referred to Our Kids. Schwindeman called that an ongoing challenge but said his group is hopeful they will be able to find couples and families in each of the parishes. Hincapie is excited by the ministry’s long-term potential as a state partner in foster care. “Not only do they have their challenges to meet their basic need but the biggest need of all is the need for love and if we’re able to meet that and show them that and be a living testimony of the love of God then we’re talking about transforming generations and breaking the cycle of abuse and neglect. “And that’s where I see tremendous opportunity for us in the archdiocese to be able to be living proof and living testimony of the mercy and immense love of God through our actions by becoming a GAL or a foster parent,” he said. Hope, Heart & Home ministry meets the second Monday of every month at St. John Neumann Church, 12125 SW 107 Ave., Miami, FL 33176. For ministry information, contact Schwindeman at eschwindeman@yahoo.comor visit guardianadlitem.org. God bless the work of HHH, Eric Schwindeman and all those involved in this important project. Children of Miami-Dade County need more loving, caring, dedicated GALs and foster parents. You can be a voice for children! Congratulations to Eric Schwindeman and the parishes for their "hands on" approach to supporting foster children. Many talk the talk, they are walking the walk. Being a Guardian ad Litem is one of the most rewarding things I have ever done, it can also be somewhat frustrating. Having the support of a parish behind you will certainly be a tremendous help to all who advocate for these children. Keep up the good work!